KALAHEO, KAUAI » Pennsylvania visitor JoDee LaCasse stopped at the Kauai Coffee Co. four times during a two-week vacation last year, but that didn't deter her from making it this year's first stop. "We're here six days, so I'll probably visit at least three times," LaCasse said. "Ever since I started drinking Kauai Coffee, I can't drink anything else." LaCasse, who was purchasing a bag of the Kauai Peaberry Medium Roast and came with her own soy creamer in tow, rates the free tour and sampling experience at Kauai Coffee up there with the isle's famous waterfalls, foliage and beaches. Kauai Coffee, home of the nation's largest single coffee orchard, is worth seeing for its sheer size alone. Hawaii island, which has close to 700 coffee farms and encompasses the famous Kona coffee producing region, is the state's largest producer of coffee overall; however, the single largest coffee farm is Kauai Coffee with 3,100 acres of trees. Kauai Coffee's one farm accounts for about 40 percent of the approximately 8,000 acres that have been planted statewide. The large-scale farm also processes and roasts coffee. LaCasse's only disappointment was not being able to sample or buy the extremely limited-edition Kauai Blue Mountain Peaberry, which sold out five days after its March release. Kauai Blue Mountain is becoming known among coffee aficionados because it is grown from the same beans as the prized Jamaican Blue Mountain coffee, which can retail for upward of $50 a pound. Jamaican Blue Mountain is often discussed in the same circles as the even pricier Indonesian Kopi Luwak, which can sell for more than $100 a pound. However, to many, Blue Mountain holds wider appeal since its flavor does not depend on one of the oddest food processing methods in use. Kopi Luwak coffee gets its unique taste by first passing the bean through the digestive tract of the Asian palm civet, a jungle cat. That can certainly turn off some drinkers. Jamaican Blue Mountain coffee is grown at high elevations. However, on Kauai the strain is grown at lower elevations along the isle's south shore between Koloa and Ele­ele. It's more affordable, too. Kauai Blue Mountain Peaberry retails for $26 for 10 ounces of roasted whole beans, while Kauai Blue Mountain sells for $16.50 per 10-ounce bag. Just for perspective, 10 ounces of 100 percent Kona Coffee Peaberry from the popular Greenwell Farms sells for $18.72, and 10 ounces of its 100 percent Kona Coffee Medium Roast retails for $16.80. Greenwell doesn't sell 10-ounce bags, so those prices are calculated based on the cost of their 1-pound bag. "It (the Kauai Blue Mountain Peaberry) came and went so fast," said Darla Domingo, Kauai Coffee retail operations supervisor. The brand is produced in extremely limited quantities since it uses peaberries, which occur randomly in nature when a coffee cherry produces a single, smaller bean instead of two beans. Only about 5 percent of picked cherries will produce peaberries. "Kauai Blue Mountain has been our top seller (at the visitor center and online) for eight years," Domingo said. "The tourists arrive here already knowing about it. We sell 25 percent more of the Kauai Blue Mountain than we do of our next-highest seller." This year, Kauai Coffee is anticipating its second-largest coffee crop of the decade and soon will harvest its largest crop ever of Kauai Blue Mountain, said Kauai Coffee Orchard Manager Greg Williams. "We're expecting a 15 to 20 percent greater yield than last year," Williams said. "We'll probably get 14.5 million pounds of cherries and from 2 million to 3.25 million pounds of green beans." It's also the first major harvest since landowner Alexander & Baldwin sold the Kauai Coffee brand and operations to Massimo Zanetti Beverage USA, which is affiliated with nationally recognized brands such as Chock full o'Nuts, Hills Bros., Segafredo Zanetti, MJB and Chase & Sanborn. Since the purchase, which closed in 2011, Massimo Zanetti has been overseeing operations of Kauai Coffee's plantation and processing facilities. Massimo Zanetti is an Italian company with U.S. headquarters in Portsmouth, Va.
"It's a wonderful new entry point for us into the growing super-premium coffee segment," said John Boyle, chief operating officer of Massimo Zanetti Beverage USA. The company also has been marketing the Kauai Coffee brand globally through its Italian parent company, which has nearly 50 companies operating in about 100 countries. "The marketing spend has been a lot higher. We are dropping coupons and using social media to grow awareness of the brand and drive traffic to the visitor center," said Brian Kubicki, Massimo Zanetti Beverage USA's vice president of marketing. "Volumetrically we are about four to five times larger due to the growth of Kauai Coffee's increased local distribution and its new distribution on the U.S. mainland." Locally, Kauai Coffee is now available at Longs, Times and Don Quijote and will soon be available at Costco on Oahu, Kubicki said. "Statewide we've got distribution from the West Coast to Florida and Maine, and we are turning our eyes to Europe and Japan," he said. "We're not where we want to be yet, but we are getting there." Russell Kokubun, Hawaii Department of Agriculture chairman, said it's great that Massimo Zanetti saw the value in Kauai Coffee. "For the longest time whenever anyone talked about Hawaii coffee, it was just Kona coffee," Kokubun said. Kona's soil and climatic conditions are extremely amenable to growing high-quality coffee, he said. 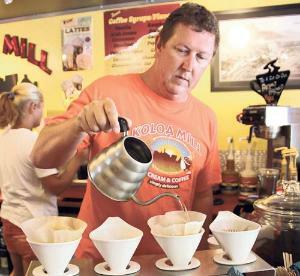 "Kona made coffee known in Hawaii and hung in there for some thin times," Koku­bun said. "Their perseverance in Kona maintained the coffee commodity market for Hawaii. Now it's growing by leaps and bonds." Kona's success has opened up opportunities for other growers statewide, Koku­bun said. Coffee has become a substitute crop for the shrinking pineapple and sugar lands across Hawaii, he said. Indeed, the Kauai Coffee brand emerged in 1987 after changing times, global competition and economics forced the nearly century-old Mc­Bryde Sugar Co. to diversify. Just five years later Hurricane Iniki swept through the island, causing about $8.5 million in damage to Kauai Coffee, Williams said. Despite the challenges, Kauai Coffee got back on its feet. By 1996, the year that MSC's plantation workers brought in its last sugar haul, Kauai Coffee was producing a higher volume of coffee than in all of Kona. As many as two dozen of Kauai Coffee's 80 full-time employees were former sugar workers, and almost all of them come from a once sugar-dependent region. "I'm very proud to be part of this company," said Ryan Manoi, a senior orchard worker who was born and raised in Wai­mea. "It creates jobs and brings in revenues for the island and the state." While Yellow Catuai makes up 80 percent of the coffee grown on the Kauai Coffee estate, Mundo Novo, Red Catuai, Typica and Kauai Blue Mountain trees offer new opportunities, Williams said. "We planted 12 to 13 acres of Kauai Blue Mountain in the 1980s after a University of Hawaii trial identified that it would grow well," he said. Kauai Coffee has been increasing Kauai Blue Mountain's acreage since 2004, Williams said. But even with 75 acres now in Kauai Blue Mountain, the company can't keep up with the demand, he said. It takes three to four years after a planting for the first decent crop to come in, Williams said. "The next big crop of Blue Mountain should come to market in 2013," he said. "But, we are looking at planting more." Increased production of Kauai Blue Mountain would take Hawaii's coffee industry higher, Koku­bun said. "Kauai Blue Mountain is really outstanding coffee," he said. "This will shake everyone up. Kona thinks of itself as having the most premium coffee, Kau is like its little sister pushing on up and now Kauai is offering a whole new set. It's going to cause everyone to amp up their game." The buzz about Kauai Blue Mountain is growing along with its footprint, said Domingo, the Kauai Coffee retail supervisor. To help keep that buzz growing, Kauai Coffee offers two free guided tours daily and a chance to see a coffee roaster in action three days a week, Domingo said. "Everybody wants to learn something new that they wouldn't have experienced back home," Domingo said. "Most of our tourists are from the U.S. mainland, where coffee doesn't grow." Lynne Ashway, a retired teacher from Rowland Heights, Calif., said touring the coffee plantation was a highlight of her family's recent Kauai vacation. "It was totally different than any of the other type of events that we did," Ashway said. "I would recommend it to other people." Before the tour, Ashway said she had assumed that most of Hawaii's coffee came from the Kona Coast. "To me Kona coffee is a little strong. I liked this better. It didn't have as much bite," she said. Kauai Coffee's taste even held appeal for Joy Braitberg's children, 9-year-old Jameson and 6-year-old Addie Mae, and her 7-year-old niece Meredith. "I let them taste the decaf," said Braitberg, who was visiting Kauai from the San Jose area. "They said it's yummy, and as you can see they've had a really good time at the visitor center." Community pride in Kauai Coffee's quality has spread, said Marn Zeeb, owner of the nearby Koloa Mill Ice Cream & Coffee, which sells the coffee by the cup and by the bag. "The locals and visitors love to find out that it's grown just 10 miles away," Zeeb said. He brews each cup to order using the pour-over method, pouring water into a suspended cup of coffee grounds and then letting it slow-drip into the cup. "We've got a 99.9 percent approval rate," Zeeb said. "I had offers to carry other brands that would pay for 100 percent of my equipment, but they aren't as good and I like supporting our local economy." While customers are waiting the five minutes it takes to make their fresh brew, Zeeb promotes the Kauai Coffee visitors center. "It's the best thing on the island that you can do for free," he said. "We sell a lot of Kauai Coffee and send plenty of visitors there." Massimo Zanetti's backing is an exciting development that is sure to expand the popularity of Kauai Coffee, Zeeb said. "All it would take to make it as well known as Kona would be a huge marketing campaign," he said. "I think this coffee is going to really take off. It's just that good." That's Massimo Zanetti's goal, Kubicki said. "For sure, (Kona) set the gold standard of Hawaii coffees, and rightly so — it's outstanding coffee," he said. "But that's where we'd like to be. There's no doubt about that."